Q. Do my gain settings have to be matched? The way I mic up drum-kit overheads normally means that there is a slight level difference between the left and right gain settings. It's not more than 10dB at peaks, but it is noticeable. 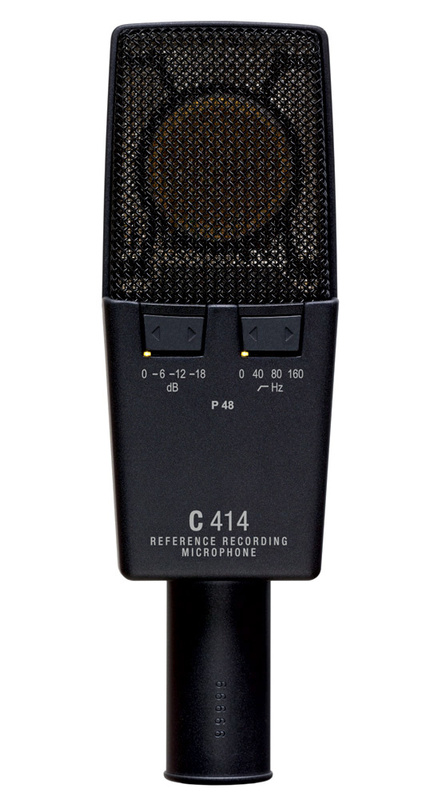 I'm using a pair of AKG C414 XLS microphones that are perfectly matched for any other work I do with them, so I don't think they're at fault, and I've also used my tape measure to check that the overheads are equidistant from the snare and kick. It's really odd because, sonically, the overheads sound the same; neither one is more bassy than the other, which might have suggested a boundary effect. I've not always got both mics pointing at the snare, though, so this may account for some level difference, and one of the mics is closer to the wall than the other (about 1m away), which might also be a factor, although that mic is pointing away from the wall. 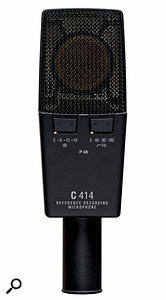 This is the rear side of the AKG C414 XLS microphone, showing two of its three rocker switches. These are quite easily adjusted inadvertently when positioning the mic, so it's worth double‑checking the LED settings before you hit Record.I'm just trying to ascertain whether my mic positioning is awry or whether it's normal to have overheads with different average levels like this. So when I'm setting up the preamps for my cardioid drum‑overhead mics, should the gain settings be matched or should the peak level be the same, even if that means I have different gain settings? SOS contributor Mike Senior replies: A level difference of 10dB between the snare peaks in each overhead mic is quite a lot so, to be honest, I smell a rat here on the technical side. Without knowing the specifics of your mic placement, I think it's unlikely that the low‑level mic's polar pattern is having that large an effect. You'd only expect a 6dB attenuation even for sounds 90 degrees off‑axis so, unless you've got the arse end of the mic pointing at the snare, I can't see that being the culprit. If you do have one mic pointing completely away from the snare and the other pointing directly at it, I'd instinctively raise an eyebrow anyway, as the tonal differences this would create between snare sounds on each channel would probably sound a bit odd in stereo. However, the proof is in the pudding, and if an unorthodox mic position such as this produces the goods for you then, by all means, just match the snare levels by mismatching the gain controls. The room might be having some effect but, again, I'd be surprised if it was an effect of that magnitude, so I can't truthfully say I'd look there for answers, especially given that the tone between the mics seems fairly consistent to you. Perhaps if the room is fairly dead‑sounding and the drummer is blocking the sight‑line between the low‑level mic and the snare, you might expect some level loss, and this could conspire with the mic's polar pattern to achieve that kind of level difference, but I'm still suspicious that there's simply something technical amiss. First off, I'd check filter or pad switch settings on the mics or preamps. Those new AKG mics have a lot of switch settings, and their rocker design makes them prone to inadvertent adjustment during normal handling. You also need to look quite carefully at the LED status indicators to check that the settings are as you expect them to be. My best guess is that you've put your thumb on the pad selector switch and knocked it down 6dB, at which point an additional 4dB level change is much more likely to be arising from your microphone positioning. My other idea would be that maybe something is awry with a balanced cable or socket somewhere, because unbalancing a balanced line can lose you 6dB in some instances too. It's easy enough to check for this, though, as it's just standard studio troubleshooting. Try swapping individual components between the two analogue signal paths and if the level difference migrates between them, also, you can point the finger of blame at whatever it is you've just swapped over.